No word has evoked as much passion in recent times as the word “globalization,” which carries an array of meanings among different people and disciplines. But the fact is that globalization is a historical process that has connected the world and influenced it, for better or worse, in every aspect of life. is a collection of more than 100 thought-provoking essays by renowned scholars, journalists and leading policymakers published over the past decade by YaleGlobal Online, now published by the MacMillan Center. 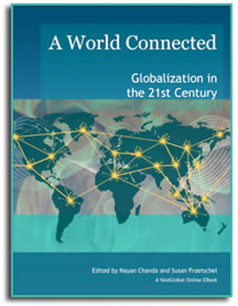 The essays are grouped by chapters on Global Economy and Trade, Security, Diplomacy, Society, Culture, Health and Environment, Demography and Immigration, Anti-Globalization, Innovation and Global Governance and offer insights about globalization trends for the future. The volume contains an introduction by the editors and a preface by Yale University President Richard C. Levin.